Today I managed to get a single game as well as fixed my Leman Russ Annihilator (the lascannons were falling off the turret). I bought another heavy weapons team for the lascannons, but I guess I'll be turning them into mortars for a 2nd heavy weapons team. Eventually I'll be getting a Brigade, but that's another story. Anyway, I convinced my opponent to take a Brigade Detachment today. He was going Ultramarines, and he almost had the requirements, and since it was for fun, I told him it was fine to go over 2,000 and get his Brigade. He brought Calgar the Chapter Master, 2 Prmaris Lieutenants, a Librarian, 2 Chapter Ancients, a Terminator squad, 3 tactical squads, 2 Intercessor squads, 1 Scout squad, 1 Assault squad, 2 Land Speeders, a Land Raider, 1 Hellblaster squad, 1 Devastator squad, a Predator Annihilator and 1 Inceeptor squad. His total points went to 2,415 or something. Or more. I can't remember, but his list continued to grow. Well, it's fine. We're playing for fun. Anyway, 9 points for a Brigade, bringing his total to 12 Command Points. Awesome. I wanted a chance to test my Kasrkins, so I managed to bring my Kamikaze Troopers Battalion Detachment alongside with my Shadowsword. So my list looked like this: 2 Tempestors Prime, 1 5-men Kamikaze squad with 2 meltaguns, 1 5-men squad with 2 hot-shot volley guns, 1 10-men squad, 2 Kamikaze command squads with plasma guns, a Valkyrie, an Officer of the Fleet and 1 Taurox Prime in a Battalion Detachment. Then a Spearhead Detachment with a Tank Commander in a Leman Russ Executioner, a second Leman Russ Executioner, a Leman Russ Annihilator, an Armored Sentinel with plasma cannon, and a heavy weapons squad with lascannons. And finally a Supreme Command Detachment of 2 Company Commanders, a Primaris Psyker, a Lord Commissar and a Shadowsword. My list only reached 2,350 points and I managed to get 8 Command Points. I didn't mind the disadvantage, I mean come on, the opponent was a kid. Giving in wouldn't hurt, right? The mission turned out to be double missions thanks to the twist, which was multiple paths to victory. So we got Supply Cache and Invasion. The former is to control the objective marker that is the supply cache by the end of turn 5 to win the game, and the latter is whoever controls both objective markers (total of 2 objective markers, each player choosing to place one in his deployment zone) wins the game. Cool. I managed to get the first turn and my opponent failed to seize the initiative. So I began deep striking all my Stormtroopers right into my opponent's lines. The Kasrkins/Kamikaze Troopers with 10 men used First Rank, Fire! Second Rank, Fire! to kill off a tactical squad, while the Taurox Prime killed another tactical squad. And the Valkyrie also killed a third tactical squad, so that was all three tactical squads obliterated in the first turn. Between the Leman Russ Annihilator, the lascannon heavy weapons squad and the Shadowsword, I blew up the Land Raider. The plasma squads, Armored Sentinel and normal Leman Russ Executioner wiped out 4 of the 5 Hellblasters and killed the Devastator squad as well as put about 5 wounds on Calgar or something. My Tank Commander killed the Scout squad. I had all my command squads and Warlord charge into Calgar while the Kasrkins charged the lone, surviving Hellblaster and killed him in close combat. However, Calgar probably killed a bunch of Guardsmen in retaliation. He either took one wound or made all his saves. Actually, I would have won the game there and then because I have secured both objectives. Thanks to my 10-men Kasrkins/Kamikaze Troopers who had Objective Secured, I had secured both Objectives even as Calgar was alone in trying to stop a bunch of Guardsmen from grabbing it. However, my opponent then elected to leave combat. 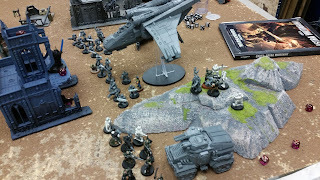 He then Deep Struck his Terminators behind my Taurox Prime, his Assault squad behind my Valkyrie, and Inceptors right in front of my lascannons heavy weapon squad. He moved and advanced one Land Speeder forward while keeping the other one stationary. He opened fire and killed a bunch of my Guardsmen - I think he wiped out the 10-men Kasrkin squad. He also killed a Kamikaze Trooper in the hot-shot volley gun with his land speeder, and killed a single plasma command squad, but had everyone else, including his Predator, shoot at my Valkyrie, bringing him to just 3 wounds. Ouch. He also put 6 wounds on my Taurox Prime with his Terminators before charging them right into my melta Kamikaze squad and killing them in combat. Meanwhile the Inceptors killed 1 lasccannon heavy weapons team and wounded another before charging and killing my Company Commander in close combat. The Primaris Lieutenants, however, were not as lucky. They charged my Lord Commissar, but failed to kill him in combat despite outnumbering him two to one. Hah! After Smiting somebody with my Primaris Psyker, I resumed shooting. Between the plasma cannon Sentinel, the Taurox Prime and the surviving plasma command squad, I killed all but 1 Terminator. I used Jury Rigged Stratagem to restore one wound to the Valkyrie so that he can shoot at his second profile. The Valkyrie killed the Assault squad, wiping them out. My lascannon squad fell back so that the Shadowsword could kill the Inceptors with his 3 twin heavy bolters. Between his Volcano cannon and the Leman Russ Annihilator, I destroyed the Predator. Meanwhile, my normal Leman Russ Executioner destroyed the first Land Speeder while my tank commander destroyed the second Land Speeder. My Lord Commissar put 2 wounds on a Primaris Lieutenant with his plasma pistol. My Kamikaze Troopers overcharged and wiped out one Intercessor squad while leaving 2 guys in the other, but otherwise I couldn't do much else. The supply cache was still being held by my opponent's surviving Intercessors. My Lord Commissar killed a Primaris Lieutenant in close combat, two of his power sword hits cleaving through his power armor. Hah! And he survived the other Lieutenant's power sword with his refractor shield! Who says a mere mortal can't stand up to a fight against an augmented Space Marine? The Terminator then charged and wrecked my Taurox Prime, leaving him with just 2 wounds (despite using Defensive Gunners Stratagem, I only succeeded in putting one wound on him), while the other shooting put 1 more wound on my Valkyrie. By this time, I lost yet another Tempestus plasma command squad, and then he killed my Lord Commissar with the Librarian's Smite, charged and wiped out my surviving plasma command squad in combat with the Primaris Lieutenant (and Calgar, who didn't do much since the Lieutenant killed them first). While he also charged my remaining Kamikaze plasma command squad and last, surviving Kamikaze squad (with 2 hot-shot volley guns), he failed to wound the latter in close combat. As for my Kamikaze plasma command squad, they were wiped out to a single man. There was not much else he could do since I had already destroyed the majority of his army. And then something hilarious happened. My Warlord Company Commander struck Calgar and cut him down in close combat. Granted, the Ultramarines Chapter Master had been weakened by a barrage of plasma shots in the first turn, and only had one wound left, but my Warlord just did that one wound, only for my opponent to fail the save and boom. Slay the Warlord. Calgar had been felled by a mere mortal. Heh. There wasn't much to say. My opponent didn't have much left on the table, and so I finished him off. I killed the Librarian with lascannons from my Valkyrie (who I repaired again with Jury Rigged Stratagem), heavy weapons squad and Leman Russ Annihilator. My Armored Sentinel killed the Terminator with his plasma cannon. My Kamikaze Troopers fell back, only to be ordered to Get Back Into the Fight! and killed the two remaining Intercessors and both Primaris Ancients. The Primaris Lieutenant was disintegrated by plasma from my Leman Russ Executioner. The Shadowsword and my tank commander didn't even need to open fire. 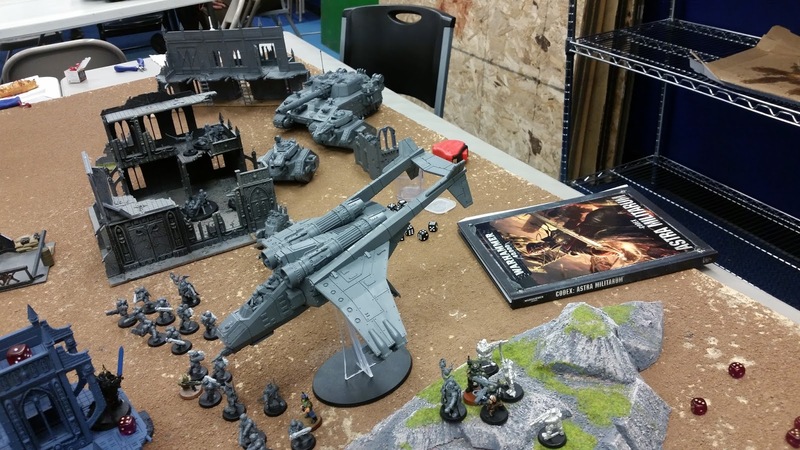 We had won the game by tabling my opponent and utterly destroying the Space Marines. 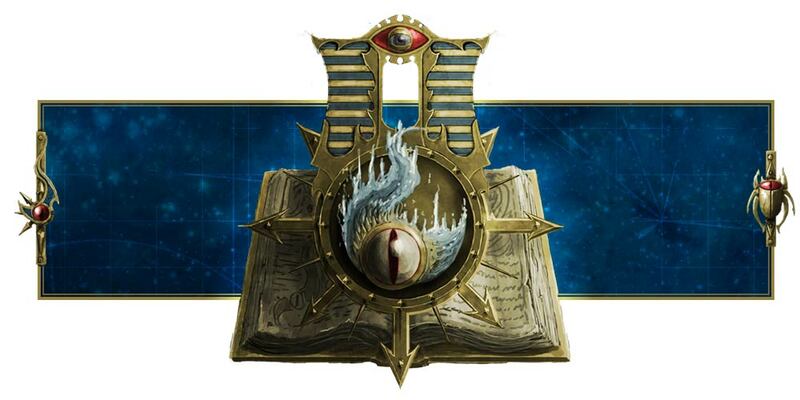 So much for Ultramarines or Ultrasmurfs. With nothing left on the table, my opponent couldn't stop me from grabbing the supply cache with my sole remaining squad of Kamikaze Troopers - oh, and I still have one plasma Kamikaze trooper left after his 3 buddies were killed. And my Warlord, who felled Calgar in a close combat duel, could just consolidate right into my opponent's objective. Not to mention my opponent didn't even touch my Shadowsword at all. There wasn't even a single wound on my Shadowsword. Or my tank commander. Or my Leman Russ Annihilator. There were a couple of wounds on my Leman Russ Executioner, which were done by me rolling ones from supercharging my plasma cannons despite my rerolls. And my Valkyrie survived despite the weight of fire leveled against him. Poor guy. But he continued to hover at 4 wounds thanks to the repair Stratagem! Phew! Yup. Another day, another victory for my Draconian Armored Dragoons and the elite Kamikaze Troopers!